An over correction almost tips me into the opaque black water. I’m sure the alligator I nearly knocked over the head with my paddle was just as alarmed. It was at this point that I graciously let Barry glide ahead, falling back just enough to avoid a collision, but follow close by to occasionally touch the stern of his kayak. He’s now officially on alligator patrol. The long, narrow channel is straddled with trees decked with Spanish moss like clumps of tinsel randomly tossed on the overhanging branches. 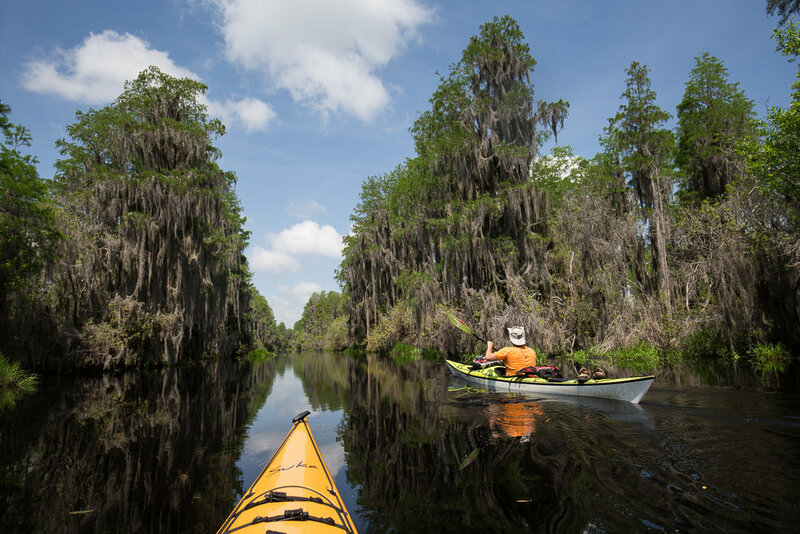 We’re exploring the Okefenokee Swamp that seeps across the Georgia and Florida border. It’s everything I’ve ever imagined a swamp to be – a black water maze studded with deadheads the size of tombstones, tall cypress trees firmly crouched in the mud, their knees poking above the water to take in the oxygen, and of course, the American alligator – alligator mississippiensis, scoping its territory camouflaged under green algae, or sun bathing on the edges of the river, with one eye open to disturbances from bright mango and lime-colored kayaks. With misguided ambition and ultimately financial failure, the Suwannee Canal, which we currently paddling on, was dug in an attempt to drain the swamp. That failure eventually led to wide-scale logging of the rot-resistant bald cypress trees. Having exhausted the natural resources, logging stopped and the land was eventually designated a national wildlife refuge that covers more than 400,000 acres. Keeping my fingers out of the water and with a clipped paddle, we move deeper into the swamp and divert into an ever-narrowing side tributary. The water is much shallower here and the trees give way to open marshy areas. We paddle past carnivorous pitcher plants and huge water lilies, and this time we surprise a siege of immature blue herons (as per proper birder nomenclature) that awkwardly balance on bleached branches. Barry promptly wedges his kayak across the channel and if it wasn’t for the scorching sun, I would have lost him for the rest of the day. Undaunted by alligators, our next paddling trip into the swamp was the northeastern tip of Lake Marion, SC. We had driven past towns with relics from a more prosperous time, now mostly shuttered along the roadside, to a secluded parking lot crowded with pickup trucks and empty trailers. We slipped our kayaks into what can best be described as an enchanted forest. While Lake Marion was built in the early 1940’s as part of the Santee Cooper Project when the Santee River was dammed to create hydro-electric power and employment opportunities, this section is more like a swirl of confusing passages and dead end tributaries. We paddled past ubiquitous bullet-hole riddled signposts, giant waterlogged stumps sprouting new vegetation and the occasional fishing lure stranded in a tree branch. There is little evidence of an artificially created environment. The towering black cypress and swamp tupelo trees form a navigable waterlogged forest. The path we make through the carpet of green algae closes in just as quickly as it parts for our kayaks, and without a GPS, we double back after a few hours, cautiously paddling around sturdy webs set by equally formidable spiders. The stillness of the forest is broken with the occasional splash from a silvery fish skipping across the water glimpsed in our peripheral vision. 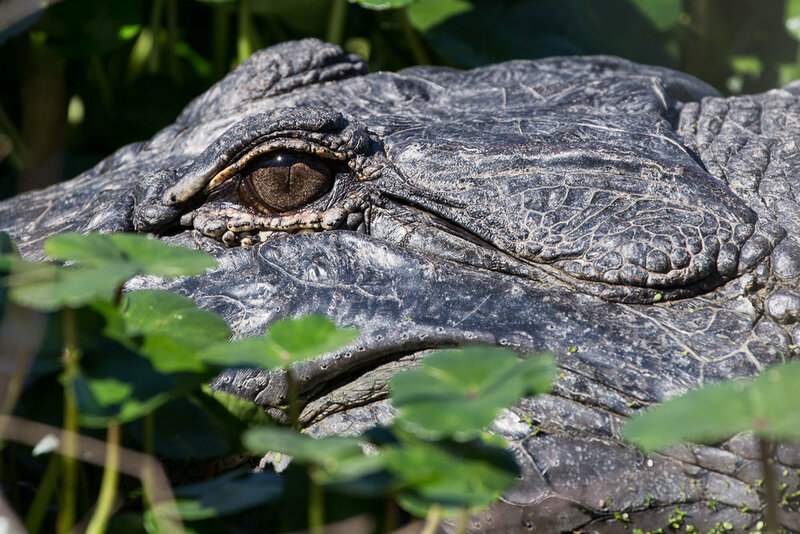 There is a sound we have come to recognize that comes from a baby alligator calling its mom. It’s a kind of a guttural chirp, and there is no mistaking it for a frog. Maybe next time I’ll be brave enough to camp on one of those elevated platforms that stands somewhat precariously in the swamp. Who needs sleep anyway?